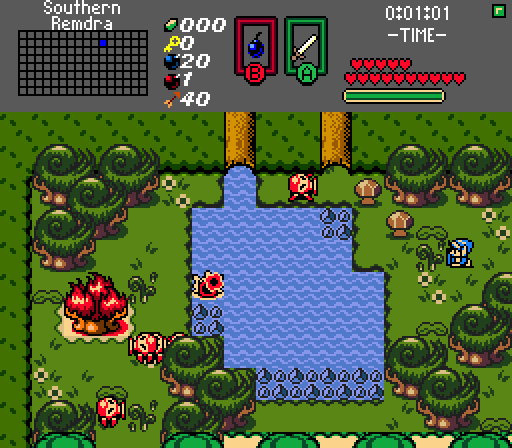 A difficult-ish quest that takes Link across the island of Remdra in his quest to rescue Princess Zelda. Quest is best played in 2.5.0, but should work in 2.5.1 final. I take no responsibility for version bugs caused by this, however. -Lowered damage on Crabalt and Leevers. -Greatly reduced Wind effect duration and added a cooldown before it can be reapplied. -Increased duration for the final boss' glyphs before they become active giving you more warning to get out of the way. -Lots of misc small fixes. 12-20-15: Increased delay on Scourge when he finishes an attack. -Fixed a bug with the new item from the bonus boss. Subscreen will look a little weird, but it doesn't bother me enough to remake the subscreen entirely to fix this. -Moldorm Prime health reduced from 48 to 36, but bombs are slightly less effective. -Bonus boss summons Death Knights much less frequently and should never summon twice in a row. -Medusa summons bubble enemies instead of hugbos. -New secret boss added on Normal and Hero difficulties. Drops an item comparible to the prize for the current bonus boss. -New secret boss is a complete sidegrade from the current bonus boss; the conditions for the quest's ultimate prize can be met by beating this boss on Hero Mode. Link arrives on the island of Remdra to rescue Zelda from what seems to be a plot to revive Ganon, but he instead uncovers something far more sinister. This quest is definitely on the difficult side, especially the boss fights. Throughout the game there are shops that can sell you a hint to defeat a particular dungeon boss. In addition, you can always lower the difficulty of the quest globally if you feel it's still too much. - Explore the overworld for heart pieces. Before each dungeon you can get at least one additional heart if you look hard enough. This quest's difficulty is significantly migitated if you keep yourself healthy. - Try using all of your items. If you try and treat this quest's combat like a lot of other quests (Sword+Boomerang everything, etc...), you're going to be in for a rude awakening. Many of the items have been rebalanced or given new functionality to make them more useful. - If you're having difficulty on a puzzle, try looking at it from a different angle. If you're still stuck, just head over to the help thread here. Finish the game to see the full credits. Special thanks to Moosh and Spaceman Dan. This would not have been possible without them. If I forgot you, just shoot me a PM. I'd like to start this off by saying, DO play this, while I have a few favorites i hold closer to heart, this might objectively be the best quest that i've played so far. Honestly saying this was a wild ride would not do it justice in my opinion. It's hard even choosing where to start. Mild spoiler warnings tho, I mention a few things by name but I personally don't think i spoiled anything relevant much. The story, probably the lowest point honestly. The starting premise if i'm honest is a bit boring, that "clan" thing particularly displeases me. However, the progression was alright, didn't make it much more than okay, but just okay is fine, story was probably never the biggest focus and served its purpose. -The Desert Pyramid has to be my favorite. my enjoyment lowered a bit due to one moving platform screen, which is honestly more zc's fault for being too sensible. there was also one magic trigger room that annoyed me you had no way to practically heal yourself nearby if you took too much damage attempting it, since you were cursed and all. I also *might* have glitched my way in that same magic switch room, unless you were supposed to use the mirror shield to somehow deflect a shot into hitting the middle one. I honestly don't know how that worked and I will have to look it up later. -Skylight Temple was sadly my least favorite, I had little to no fun on it. Perhaps there's some trick to it, but to me lakitu was just a far too annoying enemy, and its night-time counterpart was far weaker, which makes me question whenever that is intended or not. Boss was kinda decent but a re-hash of prismatic gate's was a bit disappointing. I suppose that might be more on me than on the boss itself, however. -The first dungeon was VERY well done for a first dungeon, its not too hard but I at least never felt it holding my hand. Not much else to say since it *is* just a first dungeon, but I did want to mention my satisfaction with it. -The dragon that guarded one of the halfs of the desert pyramid's key could have used a better sprite. it was an interesting fight but the amateur-ish sprite drags it down a bit for me. I'm not usuually that nitpicky with sprites but it did break the consistency, which sadly did get to me. -The other sub-boss, the cultists, was also a bit boring. I'm not sure myself to what extent this bothers me or not since I don't think a few normal editor enemies are wrong by any means, but Idk, perhaps if each cultist had their own quirk, no matter how simple, that would have been a more enjoyable fight. -I absolutely loved the pumpkin head fight, probably my favorite one. I did not know at the time that i could have a better sword for it, but if anything that added to the fun i had in the fight. -The medusa was a very interesting fight, annoying at core, but it grew on me a bit some time after finishing it. -Isn't that guy from Binding of Isaac? That was cool. I have yet to finish the bonus dungeon and its boss, so I cannot comment on it at the moment, but it doesn't change anything that has been said. One last thing I want to comment is about Hero Mode. I suppose its fine to leave it there for those that *Want* the extra challenge, but If i recall all it does is double the damage you take? Under the assumption normal mode was the base you worked on, just doubling the damage taken seems like a very cheap way to add difficulty. Can't blame anyone for not doing an entire game's worth of balance changes for a hard mode, but still disappoints in that regard. I could be wrong on my assumption, however, so my apologies if that is the case. So. Where do I start with this game? This game is truly a work of art and my favorite Zelda Classic Quest to date. This review may contain minor spoilers. Right off the bat, this game starts with a cutscene. And a good one at that. Up until this point, I had never seen a cutscene on a Zelda Classic game, so this was really great. Into the game, you can select either Hero Mode or Classic Mode. Did I forget to mention, that this game is hard? It's hard. Really hard. I could barely beat some bosses even fully equipped with potions and tons of heart containers. The game does provide a room by the beach where you can lower the difficulty. I would recommend this option for people who are really bad, like me. So with that basic rundown, let's get into the core of this game. Gameplay: Overall, the gameplay is top notch for a 2D Zelda game. The game is full of cutscenes and almost constant action. Enemies are littering every screen you come across. I kid you not there will not be a second of this game where you are bored. Story: The story is original. A mage called Venser is power-thirsty and takes Zelda to an island called Remdra. Aside from the main story, there is also a side quest in which Link must destroy all the golden beasts, and show proof of this to a man who will give you a golden tunic. The golden beasts side quest is extremely hard, pitting you against many of the game's enemies, except 20x more difficult, most of the time in a really frustrating boss room. Overworld and Dungeon Design: The overworld is littered with secrets. It is so well designed, there are over 100 heart pieces scattered around it. 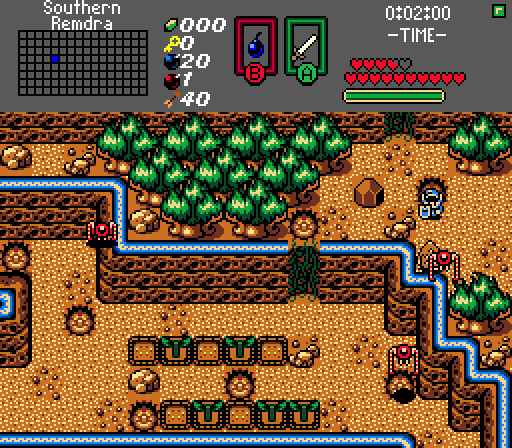 Great flow and level design in the overworld provides the feeling of an overworld adventure, and more massive areas open up as you complete the various dungeons. The goal of each dungeon is to collect the heart piece at the end. Eventually, the goal of each dungeon changes. The dungeons are filled with plenty of puzzles that'll be sure to have you scratching your head for minutes. 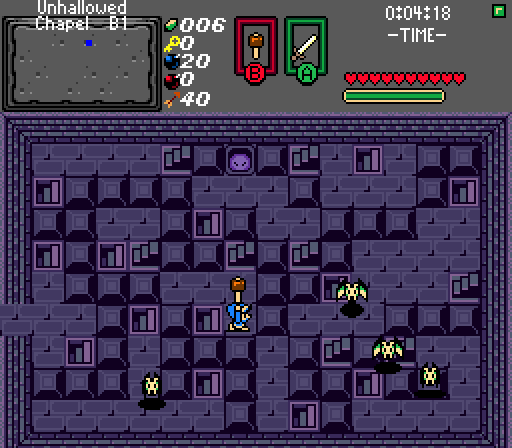 There are also loads and loads of mini-dungeons, some mini-boss gauntlets, and some necessary in the story. Mini Dungeon Remdra Prison: This dungeon is opened by the Prison key, and inside you must free a certain Moblin who gives you a Bow and Arrow upon completion. Murky Palace: I honestly don't remember most of this dungeon. I know you get the stepladder, and the boss is a real pain in the behind. Boss Arena Hollow Grotto: Basically a mini-boss gauntlet. 25 Rupees to participate. Pits you against a boss at the end (Greatblin). 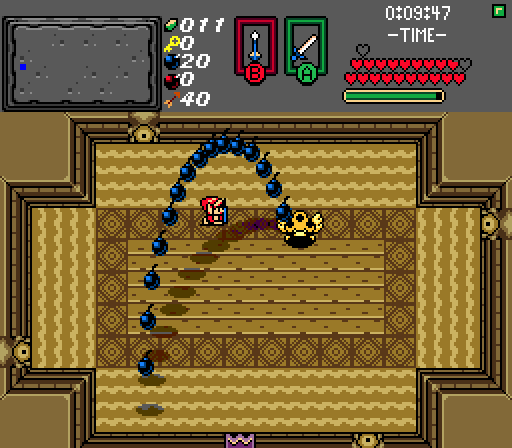 Mini Dungeon Goron's Grotto: After defeating the boss of this mini-dungeon you get the Power Bracelet. Corona Mines: Oh my goodness. The fire enemies in this dungeon are so annoying to deal with. You get the Hammer in this dungeon and fight a crazed Goron. Mini Dungeon Abandoned Forge: The music here fits so well it hurts. There is one annoying block puzzle here, had me stuck for about ten minutes or so. Unhallowed Chapel: Nonononononononono. This game just got real. Really real. This dungeon is hard, especially for only Level 4. There's also an easter egg where you can kill the boss, Scourge, early. Not recommended, though. Mini Dungeon Stormwoods Island: Every time you get hit by these skeleton pirates they steal all of your money. It hurts. Mini Dungeon Flooded Tunnel: Pretty annoying block puzzle. The gimmick with the rafts and the Lens of Truth isn't too bad. Boss Arena Abandoned Lodge: I could not get past the boss in this place until I had like 10 more hearts. I honestly enjoyed it, though. Mini Dungeon Guardhouse Armory: This music fits. Once again fighting guards and a really fun switch gimmick, that confused me in a good way. Magus Tower: This is where the second half of the game begins. The music is so epic. You finally meet Venser here, so it's crucial to the story. Sunken Basin: I really enjoyed this. The whole jungle sanctuary type vibe, with an underground lave dungeon, is really cool and offers some really cool puzzle mechanics. You think all good of this dungeon and then you get to.. that puzzle. I swear to god the solution is so random and I was on this for a freakin hour. Mini Dungeon Jungle Crypt: I really like this. Might be my favorite mini-dungeon. The boss is so much fun. Magitek Factory: Another dungeon with A+ music. I love the mechanic here, and overall, it's easily one of the best in this game. Mini Dungeon Dusty Caverns: Ok, this one is confusing. uses lots of pit puzzles, where you gotta fall down those holes. Lots of holes. There are two bosses, which are both equally creative and fun. Echoing Shrine: This one is so great. This is my favorite. Music from skyward somehow mixes so well here, and with the SFX of the chain chomp enemy. I thought it was so good, and then that's when I fell into the basement. I'll let you all find out for yourselves. 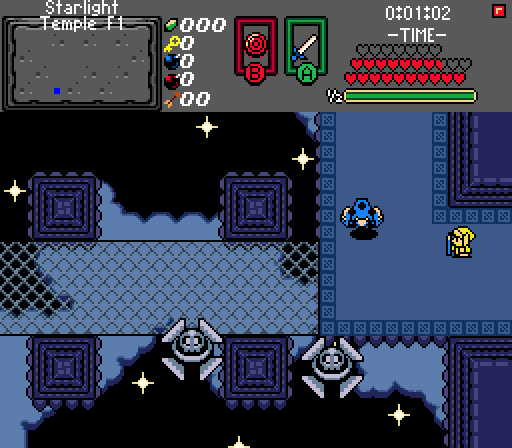 Starlight Temple: Once again, a dungeon I respect due to its music choice. This is the final real dungeon of the game. Some mechanics are really fun, including the portal sphere, others really duffed my doilies. Level X Blighted Abyss: Two words. Freaking Brutal. I can not begin to describe the pain this dungeon put me through. Besides the difficulty level, this dungeon is amazing. Probably #2 on my favorite dungeons. Boss Rush The Hall of Memories: Every single boss in the entire game all in one go with three heart refills and then you fight Moosh. Straight up 3 hours put into that. The bosses are amazing in this game. Basically, I'll tell you my thoughts on them and how to beat them. Blue Crustacean: Crabalt ~ As a first boss, this guy is pretty easy. Just wait till he comes at you and slash your sword. When he does the jump, just spam in his direction. Prison Warden ~ Just a guard with more health, pretty easy. Cybernetic Experiment: Moldorm Prime ~ This boss design is really good, as is its moveset. This boss can be difficult, so try to avoid the boulders that fall, and you should be good to go. Manhadla ~ This miniboss is recognizable from the very first Zelda game, pretty much straightforward. Crazed Overseer: Corgoro ~ This dude gave me some trouble. You can place a bomb when he shoots the fire out like an arm, and that should take him out in one hit. Patra ~ Another miniboss from the original game. Not a much of a threat to you. Enemy of the Living: Scourge ~ This guy has an obvious weak spot, but hitting it is a pain. The way his AI is programmed makes it so hard to hit his back its tear bringing. I honestly really enjoyed fighting Scourge, especially later in the Hall of Memories when you can kill him in one hit with the Portal Sphere. Hinox ~ Another straightforward miniboss. Sub-Zero Commandant: Frost Knuckle ~ I'm proud of myself for beating Frost Knucke first try. You have to break his shield with your hammer, and then attack him. Giant Manhadla ~ Just another Manhandla with two times the heads. Airborne Menace: Mothula ~ Sort of easy, but if you fall in the water its pretty much over. When it starts having the babies is when it gets chaotic. Try and stay in a corner and attack everything that comes near you, then dart in the water when it sprays the fire. Restless Spectre: Pumpking ~ This guy confused me on how to beat him. From what I gather, you needed to break his head once or twice and make sure it was near one of the wooden beams, but I'm not 100% sure. Guard Captain ~ Just a ton of powered up guards in a room. Should be pretty simple. Clan Archmage: Venser ~ First Venser battle, stay wary if the wizzrobes and manage your attacks, take a few hits and retreat. Rinse and repeat. I enjoyed this battle, but it can get annoying if you're not being very careful. This can be said for a majority of bosses. Here is when the bosses get really good. Terror of Remdra: Gleeok ~ The first phase is soo reminiscent of the first Zelda, and then when fighting in the basement, its reminiscent of Oracle of Ages's final boss. This boss is extremely well done, and really fun to fight. Servant of the Dark: Krampus ~ Basically a demon that shoots lasers. "Imma firin my lazar!" I really like this boss for what it is, I could see it being more than just a miniboss, it has a lot of potential. Fallen Angel: Lumen ~ Lumen fights are like a really good minigame. She spams everything imaginable, and all you can do is get lucky, the upbeat type of music, but also kind of unsettling, works with the type of character that Lumen is. Triforce Usurper: Venser ~ Venser battle number two has a lot of secrets to hold. If you somehow manage to beat him, you get his rod, but the game literally makes it impossible to do that. I have yet to do it. 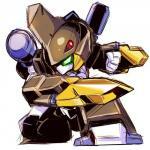 Bio-Mechanical Weapon: Meta Arrghus ~ This boss goes by fast. Reminds me of that one boss from Majora's Mask, and the design is really good. Its moveset is clever, and so is the gimmick to defeat it. Subrosian Cultists ~ Tons of Subrosians running around a room shooting beams at you. I really like this mini-boss. Dust Flyer ~ Kinda like a sandy version of Mothula, but way easier. Corporeal Nightmare: Medusa ~ This boss fight took me ages to complete, but it was fun. The AI has almost random movement which makes everytime different. There are tons of different things coming at you at once, it gets your heart really pumping. Vengeful Spirit: Lumen ~ After defeating Lumen, she comes back to get revenge on Venser and to do that she needs dem crystals man. So naturally, she tries to kill the person who saved her. Great going Lumen. Destroyer of the Gate: Venser ~ Final boss, first phase. The floor effects in the boss arena are really cool, and it really feels like the universe is collapsing. Definitely a fitting ending to this amazing game. Dimensional Abberation: Venser Reborn ~ Second Phase: So now Venser is overpowered, but if you have the True Master sword this fight is easy. Moosh ~ Kind of a joke. You fight him at the end of The Hall of Memories. My reaction when I saw the last boss in the Hall of Memories was Moosh "......uhh... I'll take it". Two minutes later I was staring at the Game Over screen. That's just my life in a nutshell for ya. Tartaros ~ This boss is literally the hardest boss in Zelda Classic history. It has, I think, three phases to it. It starts as just a big thing, I dunno how to describe it, that summons Krampus. So then you gotta fight Krampus again. Once you do that you gotta take out that thing, and when you do that it turns into a demon. It has wings and can take you out in like three hits. This thing is insane. ??? ~ This is a secret boss only unlockable upon completing everything in Hero Mode and going back to the Hall of Memories with 30 hearts. It's like a gray version of Link and had tons of movesets. If you get this far into the game, by this point you know what this guy is. If you get here: Good Luck. So that wraps up every boss in the game. If I missed any, please tell me and I will add it. And there is one final thing. The music. Music: I feel like I could talk about this for hours. Not only are the songs used so good, they fit their scenarios and that's not something everyone can say. Picking music that fits so perfectly with an original game concept is hard as is, and this game does it perfectly with every single track! Evan20000 made a truly amazing creation. This game is indescribably good. In fact, this game deserves to be a canon Zelda game. This game defines Zelda and what Zelda is. This is the definition of Zelda. If this game isn't then I don't know what is. In conclusion, I give this game 5/5 stars. This game is perfect, in almost every way. Maybe that's why I broke the timer and have it capped out at like 99:54:04 or something like that. (If I made any mistakes or left anything out, please feel free to tell me, and I will gladly fix it. It's been 3 years ever since this quest was released and nearly two years ever since i started playing this. I just finish the game for the second time on hero mode (Including the bonus content) so i decided i will review it (This is my first time review a ZC quest so don't blame me if i miss something). Game Play: In terms of difficulty this quest is HARD! And i was ready for It, Mainly because i played hero mode first before trying normal. This is also the first quest i played to have scripting in it which made me like it even more. Not much else to say really. Story: A Wizzrobe in white who happens to be a false god from a different dimension who wants nothing else but to go home and needs the Triforce in order to do so ... Neat o! Design: The design of the quest is amazing, Great designed over worlds and dungeons, the fact that this quest uses the Oracle Tile set makes it better, i was getting little tired of the classic tile set. Level 1 (Seaside Ruins): Simple, Short, good design, good music, perfect for the first dungeon. Level 2 (Murky Palace): Another simple dungeon but longer and harder, Perfect music as well. Level 3 (Corona Mines): Harder than the first two, Long, Great music and design. Level 4 (Unhallowed Chapel): Difficulty Spike! Not saying its a bad thing but still, long and hard, good design. Level 5 (Frozen Enclave): Easy than level 4 but longer, Good music and design, enjoyable boss fight. Level 6 (Undersea City): A cool down from the remaining dungeons, somewhat short but a little difficulty, atmosphere of the dungeon is great. Level 7 (Magus Tower): MAJOR DIFFICULTY SPIKE! but is a lot of FUN!, Great Music, Tough Puzzles, Good Design. Level 8 (Sunken Basin): Another little cool down from the last dungeon, It felt draining to go through but it was saved by the design and music so it's still a good dungeon in my book. Level 9 (Prismatic Gate): Difficulty Spike! Again But still good, Huge and complex, Great Music, tough enemies (sometimes annoying), Best thing about it is it's Boss. Level 10 (Magitec Factory): It's huge and complex and wasn't that much fun to go through, Music kept me entertained, The best thing about the Dungeon is it's item but the Boss .....eeeeehhhh. Level 11 (Echoing Shrine): I can see why people love this dungeon, It's more puzzle base than it is combat, The Music is good, Love the Boss. Level 12 (Starlight Temple): I really like this place, Great design and Music, Hardest out of the rest of the Dungeons, The Boss is also Great. Bonus 1 (Jungle Crypt): Somewhat short but difficult, Good music and design, Good Puzzles, Love the Boss. Bonus 2 (Blighted Abyss): This is the Award you get for getting all 20 Cursed Skulls, Great Dungeon but was a PAIN!! to get through, Tough Puzzles and Enemies, And the Boss ... oh my the boss... Hardest boss i have ever fought and my most favorite out of all of them. Blue Crustacean Crabalt: Basically this is a level 3 leaver who had sonic the hedgehog for breakfast with a dash of Fire trails and Space Jump Boots. The first time i saw this i was like ...Really a Level 3 Leaver, BOOOOOO! (Then Phase 2) MUCH BETTER (Death Explosion) Take that Fire Sonic Crab Leaver thingy (Idk LOL!). Cybernetic Experiment Moldorm Prime: A Super Version of a Giant Moldorm with the ability to Fly and cause Boulders to fall from the ceiling (My First Reaction as it appears on screen) DUDE that thing is Huge! (Flying Boulder Attack) Since when do Moldorm have the ability to fly, did he take levitation lessons from Goku or something? (Death Explosion) Take that Super Flying Moldorm... Thing (Defeating it with Bombs) ......................Whaaaaaaaaaaat! Crazed Overseer Corgoro: A tough goron who had a heaping pound of Durability Fruits and Fire Spices, And also grows fire arms, nice! Enemy of the Living Scourge: A dark demon with a obvious weak spot (Not Much to say). Sub-Zero Commandant Frost-knuckle: Really Fun Boss Fight! i died a lot during my first play-through mainly because i couldn't tell the difference between when hes going to slam into me with a fire trail or jump and squash me like a bug. Airborne Menace Mothula: This thing is hard! I did not have much fun fighting the thing not because of the boss it's self, it's because of the arena you fight it in, i know what you were going for but it didn't work. Clan Arch-mage Venser: I love this boss mainly because of how the boss plays out and the music Trash Head. Terror of Remdra Gleeok: This thing was HARD! but only took me 16 tries to beat (My first Reaction to defeating the first phase) ............Whaat? Really Evan, Thats it? Thats Just disappointing! (Phase 2) What He survived! Fallen Angel Lumen: This is one of my most favorite bosses in the game. The music, more than Perfect for this battle, the fight it self is fun, makes me want to do it over and over and over and over again. Bio-Mechanical Weapon Meta Arrghus: This fight was somewhat fair but wasn't that much fun to fight. Corporeal Nightmare Medusa: Fighting a Monster from the Greek times, that's something new. This fight RULES! It's fast pace and the music fits it perfectly. Vengeful Spirit Lumen: Not as much fun as the first encounter but still good, chances of a flawless victory ...maybe, but while she is in rage mode: ABSOLUTELY NOT! Destroyer Of The Gate Venser: This boss is just like Venser from the Prismatic Gate but with more space to fight and the fact he no longer summons enemies (I Wonder Why?). Unlike Venser 2, this fight is more enjoyable. Dimensional Aberration Venser Reborn: I love this part of the fight as well as the first part. The Music, PERFECT! Design, Awesome. Good thing this is only a fraction of his true might. I can imagine fighting Venser at his maximum power. Hall of Memories: It's a boss rush, it's very hard. Enough said. Servant Of The Dark Krampus: Another Fun Boss Fight. Getting a flawless victory ...Why yes i did. ??? (AKA Sasic): This Boss Is HARD!!!! and very enjoyable and the item you get for beating him makes it worth it. P.S I laugh when Sasic commented on the fact that i used both of my potions. Slumbering Horror Tartaros: This Boss........... THIS BOSS!!! OMG!! I got a few words to say about him. Let's star from the beginning, 3 years ago when i stumbled upon a video of MyFace Fighting Tartaros on Hero mode. During the first minute of the video i was like this looks hard and i glance down to the player who happened to be link and my eyes were wide open. (Phase 2) OMG! (Phase 3) IS THIS EVEN A ZELDA BOSS!!!??? (I glance back towards link) YES IT IS! (My eyes became a big as the earth and my jaw drops all the way to Pluto LOL!). After that i was like, Thats it! i want to fight you. It took me months to find out where the boss came from and i was lend here (The very first time i found this site to i believe). So i downloaded it and start playing all the way up to blighted abyss, That place as i said was a pain to get through. Now i was ready for the fight, i was pumped up and very exceeded and when i entered the room i was wiped out in 15 seconds FLAT! This was my hardest fight and the best thing i achieved yet (That and defeating FroggerX on Swindle). It took me an embarrassing 312 TRIES! to beat him. The Reason why i took so long is the fact that 1. 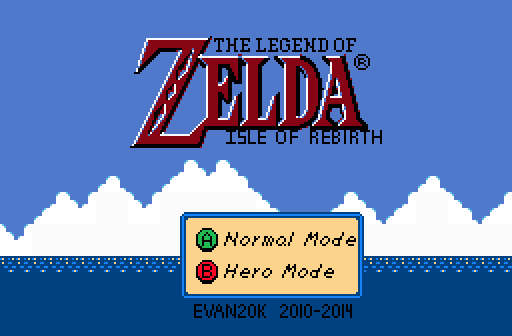 I played hero mode before even trying normal mode (Which is a dumb reason all on it's own) 2. I underestimated him 3. I Could Not Control his death knight summoning in phase 3!!!!! 4. The Bloody staff is just a piece of trash (Seriously, just throw that thing away). I eventually beat him and i was like: YEEEEEEEEEEEEEEEEEEEEEEEEEESSSSSSSSSSSSSSSSS!!!!!!!!!!!!!!!!!!!!!!!!!!!!!!!!!!!!!!!!!!!! HA HA HA HA HA HA! OMG!! (That was my real reaction to this). I got curious and went to see if Tartaros is actually dead and it turns out he's refightable (I don't know if you did that on purpose or an accident) and i beat him again on my first try. Now i just keep re-fighting him over and over and over again to the point where i can beat him effortlessly without a potion. Now that i got that out of the way it's time to describe the fight it self. Phase 1: Simple and Easiest of the 3 phases, Krampus comes out to protect his master (at least that's what i assume) he fires lasers which are easy to dodge but one question, out of all of the times i beat tartaros, Krampus never rotated his laser why is that? anyways he also fires fireballs, again easy to dodge and breaths out fire rings as he moves, this attack i hate because i can barley get close enough to hit him with the staff and he summons vires, they are a pain to deal with. Phase 2: Krampus dies and the cocoon is left to defend it self. So it's attack, Summoning a death knight to kill you that's easy to dodge and get rid of them. A Laser Sweep, Easy to dodge and get a double hit on him. Bubble Waves, again easy to dodge and get a double hit. Fire Streams, I rarely get hit by those and it is hard to prediction where the fire is going to bend. Wind Sweep, do i really need to say it. Phase 3: Link breaks open the cocoon and the beast raises from the debris to finally challenge him face to face, this phase is the hardest of the 3. It's attacks are the hardest to dodge in the game and deal the most damage. His Wind Sweeps, Easiest to dodge but you get punished hard if you get hit. Summing Death knights, he summons two instead of one, easy to get rid of (sometimes). Bubble Wave Shotgun (idk that's what i call it) that attack is the bane of my existence but now i have a easier time dodging it. Fire Stream, Easy to dodge expect when he gets nasty and drives me into a corner. Super Wirlwind, easy to dodge if it doesn't home in on you. Bubble cluster, happens only when he's at half health and it easy to dodge. Giant Laser (along with whirlwinds), hard to dodge if your in the middle of the screen and you get punished hard if you get hit. and finally his raining death attack (idk), it's the hardest attack to dodge mainly because he starts to home in on you in an attempt to corner you. Tartaros is not only tough but really smart, he knows what attacks your bad at dodging and uses them more. He also uses more wind attacks to drain your magic and summon more death knights if you have less magic, is there anything else you program into his AI. The item you get makes it worth beating him, a health regenerating ring? Defiantly worth it! In short i love this boss and it is my most favorite (I'll eventually get payback on him someday, With my own custom boss). Final Word: there's not much to say, Isle of rebirth is a great quest and i recommend it to anyone who loves a good challenge. 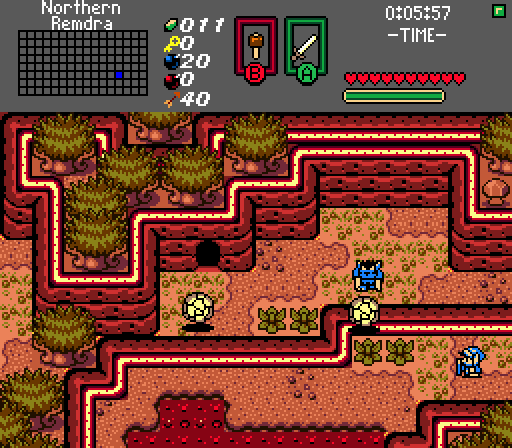 It's custom bosses, Dungeon design, amazing puzzles makes this quest a fine example of what Zelda Classic can do. I give this quest a 5/5 star rating. it has fun boss fight, it's dungeons are huge and complex but are fun to go through (Even level 10 and level X) Amazing puzzles that makes you have to think outside the box, and it has a good story. I love the music choice for this game. Is there any way I could get my hands on the music, or the names of the tracks? Does anyone have the password? what is the music for Level 3? the ultimate level (on the Dark Relem (not the final boss) ) is so difficult ! :O and what kind of treasure we can find there ?